You or a loved one have been injured in an accident. No matter what type of accident, be it a car accident, slip and fall accident, dog bite or wrongful death...It is all overwhelming to say the least. Not only do you have to deal with medical treatment, property damage, and insurance companies, but you have the daunting task of hiring the best accident injury lawyer. Here at Steinberg Injury Lawyers, our strong track record of winning cases speaks for itself. We have been extremely successful in helping our clients receive the highest amount possible for their personal injury cases. Take a moment and look at this list of just a few of the numerous high dollar verdicts and settlements we have obtained for our clients. 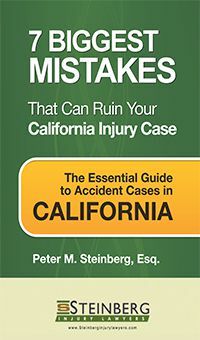 Download our free book - 7 Biggest Mistakes That Can Ruin Your California Injury Case. 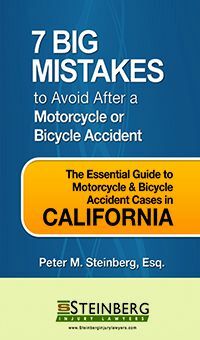 We wrote this book to answer questions and to also help you avoid doing anything to harm the results of your case. (Remember that the insurance companies are not working for your best interest). Call us now for a free, no obligation consultation.